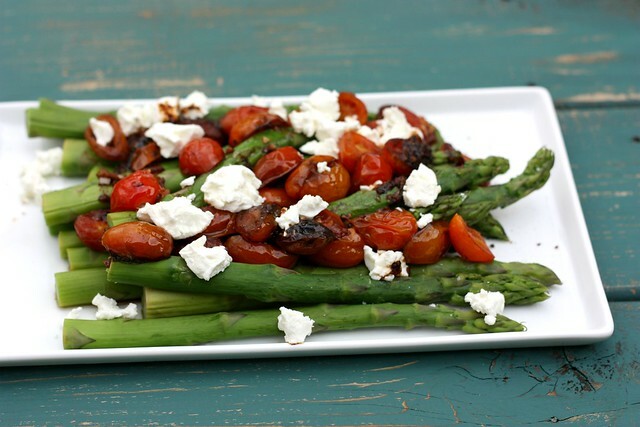 Asparagus with Balsamic Tomatoes and Goat Cheese – Elly Says Opa! The picture of this asparagus came across like a beacon of light on my twitter feed, a feed otherwise filled with…disbelief? horror? ridiculousness? When you’re scrolling through thinking “NOW WHAT HAPPENED? UGH. WHY WOULD YOU…Oh okay, that’s pretty funny. WAIT, ARE YOU KIDDING ME? NO.” and you see a picture of all your favorite things in one picture, all is good–at least for a few seconds. I have a hard time picking a favorite from any food group, but I do think asparagus might be my favorite vegetable. Or maybe it seems that way because it’s in and out of season so quickly I’m always sad I didn’t eat more of it. I’m pretty married to roasted (or grilled) asparagus so my initial reaction to blanching it was not a positive one, but it really does work well here. The asparagus remains nice and crisp and keeps that…asparagus-y (?) flavor but is complemented so well by balsamic (which I use to roast it much of the time anyway), sweet tomatoes, and creamy goat cheese. 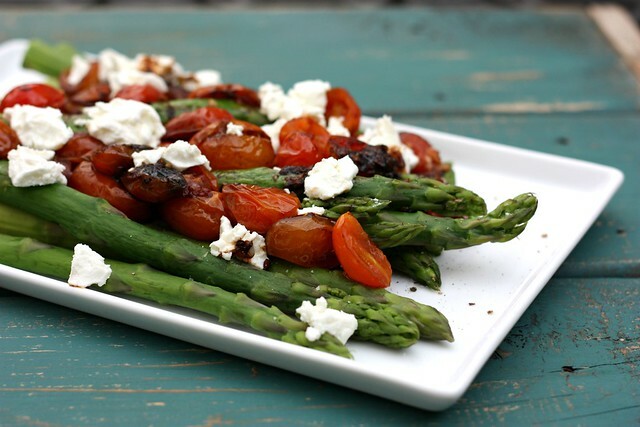 So yeah, asparagus with balsamic tomatoes and goat cheese: your short respite from the crazy/terrifying hashtags. Boil the asparagus in water for about 2 minutes, or until tender-crisp. Heat a large skillet over medium-high heat, and then add the oil. Add the tomatoes and cook for 4-5 minutes. Stir in the garlic and saute until fragrant, about a minute. Add the balsamic vinegar and cook for 3 minutes. Season to taste with salt and pepper. Arrange the asparagus on a platter, season lightly with salt and pepper, and top with the tomato mixture. Sprinkle goat cheese over the top.